SuSE is billed as a complete easy-to use Linux package providing users with a large set of programs. SuSE 7.3 is available in two editions: a Personal Edition and a Professional Edition. The Personal edition is primarily for Linux beginners and has a ‘relatively’ small set of applications included in the package. This review will focus solely on the Professional Edition. Currently SuSE Linux 7.3 is only available for the x86 family of processors although it shouldn’t be too long before the Alpha and PPC editions are released. SuSE doesn’t limit itself to producing Linux distributions. Also available from this software developer is VMWare, a program which lets you run multiple operating systems, and VMware GSX Server. SuSE also provides their own range of training courses, consulting from their 100+ Open Source in-house developers as well as support services ranging from installation support to full business and advance support. So what do you get in the package? Many common graphic cards are supported including ATI Radeon, nVidia GeForce 3, Matrox G400, G450 and 3Dfx Voodoo-5. SuSE includes several OpenGL drivers (nVidia GLX, DRI, Utah GLX and Mesa/Glide) in addition to Mesa software rendering. OpenGL support is also provided for the Diamond FireGL 1/2/3/4 boards. All of these OpenGL drivers are still in an experimental stage. OpenGL configuration, printing, together with lots of tips and tricks for the Bash shell. (195 pages). With so many applications being included in the SuSE distribution, installing from the 7 CDs would have reminded me too much of my first steps with Linux (a 50 floppy SLS distribution). Thankfully a DVD is also included in the package, so with this inserted in the DVD drive, the machine was booted. As the main test machine exceeded the minimum requirements for YaST2 (64MB of RAM and a 120 Mhz processor), we did not have to resort to a text based installation. YaST2 is a graphical central configuration tool that aims to make installing Linux as easy as installing Windows. The installation was very automatic with very few decisions needing to be made. First we selected the language for the system and the timezone. We chose a new installation, on a fresh hard disk which did simplify things a little. Once we had accepted YaST2’s suggested partitioning of the disk all that was left for us to do was choose the scope of the installation; whether to have a minimum system, a default system with or without office, or all the packages. LILO was installed onto a floppy for convenience. A root password was chosen and a non-root user set up. The partitions were formatted by YaST2 and it then proceeded to install the software. The main test machine had the full installation installed, although we later installed the default system onto another disk. The complete installation took about 90 minutes to install the packages, taking about 6GB of hard disk space, whereas the default installation took only a little over 20 minutes. The system rebooted the basic system; now it was time to configure the various hardware in the machine. YaST2 chose a fairly conservative 1024×768 @ 60Hz refresh rate for the desktop setting. This was a sensible precaution as it is possible to damage a monitor by driving it beyond its limitations. We reconfigured the monitor setting to a more reasonable 1280×1024 @ 99Hz resolution/refresh rate. YaST2 correctly identified the network card, printer, modem, sound card and tv card in the main test machine which was very impressive. Although the mouse was configured for use we did had to manually enter the line. Option “ZAxisMapping” “4 5″into the XF86Config file to get the wheel to function. During the installation we followed the Quick Install manual which made the whole process extremely easy to follow. If only other Linux distributions had such clear documentation included! On a Tyan Tiger S1692D dual PII motherboard the SuSe 7.3 installation proceeded smoothly. The sound card wasn’t picked up but it was a cheap 10 quid board so that is not surprising. However more seriously after a few minutes of inactivity the machine appeared to hang. This isn’t a problem with the machine as far as we know – it works fine with Mandrake 8.0 and Redhat 7.0. It appears to be a problem with the hard disk powering down which may be connected to the 2.4.10 kernel – we are currently investigating further. SuSE also found the correct Linux partitions on which to install on the dual PII machine (which also boots to Windows ME and Windows 2000). These held a previous Mandrake 8.0 installation and so no re-partitioning was necessary with SuSE 7.3. There are a number of important improvements that SuSE 7.3 offers. Included in the release are updated versions of important components, the kernel, XFree86, KDE, GNOME and glibc. In addition SuSE 7.3 now provides a smoother installation than in previous releases. YaST2 now has more modules included which helped make the installation of the Hauppauge WinTV/PVR card child’s play. It wasn’t that long ago that configuring a tv card for Linux was pretty hairy! Furthermore SuSE 7.3 automatically recognised the Yahama CD burner which was particularly impressive as it is a recent model. Other improvements that have been made to YaST2 include a configuration tool for the SuSE firewall, LVM and scanner configuration. Unfortunately many scanners are still unsupported in Linux, although this isn’t a criticism of SuSE. As always it is very difficult to write device drivers for hardware where manufacturers refuse to release the specs. SuSE have also added support for Soft-RAID which increases data security and performance. JFS and ext3 are featured in addition to the standard filesystems and YaST2 now even lets you partition the filesystem while the system is running. From an applications perspective the latest KOffice, Samba 2.2, XFree86 4.1.0 are included. 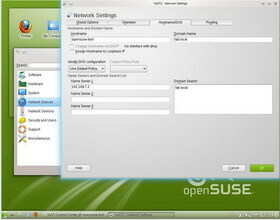 SaX and SaX2, SuSE’s Advanced X Configuration Tool, lets you configure XFree86 3.3.x and 4.0 respectively. SaX2 now boasts support for cloned multihead graphical displays. Graphics tablets and touchscreens are now also supported by this tool. There are many other minor improvements to SuSE 7.3; this is after all an incremental release. The most apparent feature of SuSE that sets it apart from other distributions is the sheer number of programs that are included in the distribution. This has the advantage for people who are on metered net connections; almost all the software you would ever want to download from the net has been included on the 7 CDs and DVD. In addition, having 2,300 applications in binary RPM format potentially saves some headaches that can arise when trying to compile Linux software. The range of the software included is impressive although there is a lot of duplication. Demo versions of commercial software are also included in the package, which are particularly useful as they generally are large downloads. Having so many packages has meant that the distribution is spread over 7 CDs, which would be mildly inconvenient when installing the software if it were not a handy DVD that is also included in the distribution. SuSE has developed an extremely polished installation, and with the Quick Install Manual should mean just about anyone can install this distribution. Almost all the hardware in the main test machine was correctly identified and configured, with the only minor blemish being the wheel mouse. A nice touch, when choosing the default installation, was that YaST2 recognised that there was a TV card in the machine and installed kwintv automatically, even though the default installation wouldn’t have automatically installed it. Even though SuSE Professional 7.3 has only just been released the system update feature, in YaST2, identified a number of patches to be installed via the internet. The power of this feature should not be underestimated; having an up to date system with the latest security patches with minimum effort is a definite advantage. SuSE YOU also makes system upgrades very straightforward. SuSE have made an intelligent choice making KDE 2.2.1 the standard desktop. However, if it’s not to your taste there are more than a dozen other alternatives available on the DVD including GNOME. KDE has developed into a mature desktop environment and SuSE have configured it so that there are shortcuts on the desktop for all readable disk partitions and key programs. The amount and quality of the printed documentation with the distribution is also very impressive. With over 1,000 printed pages, the 5 manuals provide an excellent reference, which is further supplemented by the comprehensive online documentation. The Yamaha CD burner was automatically installed by YaST and we were burning a CDRW within minutes after installation. The hardest decision to make was which CD writing software to try first (we plumped for KOnCD). Maybe the biggest failing with XFree86 is still the poor fonts support. Although anti-aliased fonts are supported by KDE, they are second best to the fonts that are included in Microsoft XP. A shell script, fetchmsttfonts, is supplied with SuSE 7.3 which does automate the installation of some nice anti-aliased fonts but these are obtained under license from Microsoft! Some might see this as rubbing salt into the wound! This isn’t really a failing of SuSE directly; other Linux distributions have the same problem. But it certainly takes away a little of the polish away from the attractive desktop environment. Maybe this is an area that SuSE might want to invest some time into it? Although automount is supplied with SuSE 7.3 it has not been configured so that partitions are mounted and unmounted, on demand, seamlessly in the background. Mandrake already supports this feature which, although not critical, makes the distribution a little less newbie friendly, especially for windows users where the concept of mounting and umounting is an alien concept. YaST2 is an excellent control center application being both simple and intutitive to use. However it is, and always has been been, sluggish in operation. It also requires a machine with at least 64MB of RAM to use this graphical configuration tool. This will mean that the text based installation tool will have to be used on many lower spec machines; fortunately RAM is so cheap these days. SuSE Linux Professional 7.3 is an excellent distribution and comes with our strongest recommendation for anyone who has ever installed Linux before. As the Professional edition has so much software, a Linux newbie may feel overwhelmed by the choice on offer; for this reason we recommend that a Linux beginner try the Personal edition first. SuSE did a great job of making the installation as easy as possible and with the slick KDE makes for an extremely usable system. The DVD is a welcome extra, the documentation is excellent and the sheer range of programs awesome. The review was a little delayed by SuSE’s insistence on including Tux Racer in the distribution. We managed 55 frames per second from the Radeon card when running this game which was fairly impressive from the DRI OpenGL driver. For die hard windows users, the WINE system is included and we successfully run many Windows applications with this software including Quicken, Corel Photopaint and Agent. We would want to test this distribution for a longer period before recommending using this to be used in a corporate environment; many of the fundamental components are the latest versions. But from the limited tests carried out it functioned perfectly well as an Intranet server running Apache, MySQL and DB4Web. Overall this is SuSE’s best ever distribution and looks like being our favorite Linux distribution, at least for now. Surprisingly even with a full installation many of the programs on the DVD are not installed. Most of these are minor tools and utilities, but there are some heavyweights. Opera is one of the most promising applications for Linux and is fast becoming a contender for most popular Linux web browser, but even with the full installation option it isn’t installed. Of course it’s a simple operation to install Opera with YaST2. Other heavyweights are that on the DVD but are not installed include Kylix, Borland’s Rapid Application Development tool, and the System and Reference manual. Although there are 2,300 applications included in the distributios there are a new notable omissions from SuSE 7.3. Pan, a popular GNOME newsreader, hasn’t been included in the distribution; neither has gqview, an image browser that features single click access to view images and move around the directory tree. Other notable absentees include ftape, elm, majordomo and kruiser. However it is inevitable that many free Linux packages have to be omitted and tough choices made solely because of the huge number of programs that are now available; LinuxLinks.com lists over 10,000 Linux software packages. » Pretty hard drive recovery service on this resource.